Computer supported collaborative work (CSCW) is a multidisciplinary field which seeks to understand cooperative work which makes use of information technology. This may include how technology is used in face-to-face settings as well as when individuals are geographically separated. 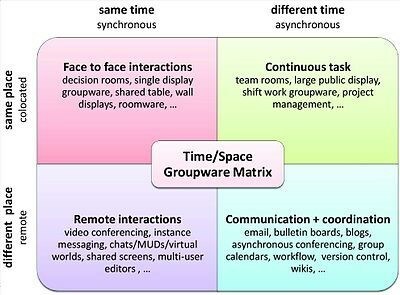 A range of synchronous and asynchronous technologies can be considered to support CSCW in both remote and collocated spaces, as reflected in the image below. I reflected on the range of technologies I am currently using to support my own CSCW. There are heaps available now: email, messaging, learning management systems, content management systems, synchronous meeting tools, collaborative documents, blogs, discussion forums, video platforms, document sharing, the list goes on. On projects many of these used in conjunction with one another to form shared information repositories, communication tools and computational power. Sometimes we have a choice about what technology is used in a project and sometimes we do not. I find it interesting how teams form and negotiate technologies to support their collaborative work. Technologies are volunteered based on past experiences, or perhaps simply based on what everyone has access to. The selection of tools to support CSCW may occur without much consideration, and this presents a risk to success. The appropriate selection of a suite of technologies which meets the needs of the group can have a great impact on collaboration (Olsen & Olsen, 2014). I am really interested in some of the different designs of successful CSCW and exploring the variables which impact success. Computer supported, interrupted, or altered work? Last week in class we were prompted to consider whether information technology makes us more productive in our work. My initial thought was yes, as information technology enables rapid access to information repositories, communication tools and computational power. Peggy suggested that the notion of productivity was inherently hard to measure in this context. Perhaps technology distracts more than it enables productivity as individuals may be spending more time learning the new technology than being productive? In the case of computer supported work where individuals are distributed geographically, I appreciated the notion of articulation work. Articulation work is the planning and communication work required to enable geographically distributed workers to be productive. Bannon & Schmidt (1989) suggest that too often technology is built with a focus on information flow between individuals. There must also be a consideration of the articulation work required to make the “flow” possible. Articulation work is an important component of successful CSCW and takes time and energy to facilitate. I recognize that technology has the potential to alter and redesign existing work patterns. This is an important reflection for designers of technology who want to have their projects used successfully. CSCW researchers seek to understand, so as to better support, cooperative work (Bannon & Schmidt, 1989). This includes seeking to understand the context and culture in which the work occurs. In the context of CSCW cognitive ethnography seeks to study how individuals act and construct meaning from their environment via material and social means. This research approach acknowledges individuals close connection to their environments. As such action and meanings are understood to shaped by context and culture. The cultural ethnographer seeks to understand the ways in which meanings are created and shaped (Hollan, Hutchins & Kirsh, 2000). I was quite interested in the discussion in the Hollan et al. article on the ways that people use representations in their work. Software provides a number of opportunities for creative representations which impact our work. Examples might include naming a file in a certain way to that it appears at the top of a directory, creating notes to self on a desktop, leaving programs or documents open to remind you of work outstanding. These representations allow one to use the affordances of the virtual space to shape future actions and off-load memory (Hollan et al., 2000). I am particularly interested in the idea of affordances in software. How do users interpret their environment, how does this shape what they perceive is possible and what they actually do? What creative uses of software are made possible through un-constricting affordances? I believe that cognitive ethnography may be a useful approach for researching affordances as it encourages a close lens for viewing individuals acting in their own context. The challenge in developing my own research project will be to construct an environment where individuals may be observed closely as they design computer support collaborative learning (CSCL?) spaces. Ideally designers could work in pairs talking through the design process, building collaborative spaces online, all the while being video recorded as well as screen recorded. This would create a daunting amount of data! However, it would provide a rich tapestry for understanding how faculty perceive, create and construct CSCL. Bannon, L. J., & Schmidt, K. (1989). CSCW-four characters in search of a context. DAIMI Report Series, 18 (289). Olsen, J. & Olsen, G. (2014). How To Make Distance Work Work. Interactions, XXI.2 March + April 2014, pg. 28. Association for Computing Machinery. CSCW 586 Blogs: Understanding computer supported cooperative work and a potential research approach by Michael Paskevicius is licensed under a Creative Commons Attribution 4.0 International License.